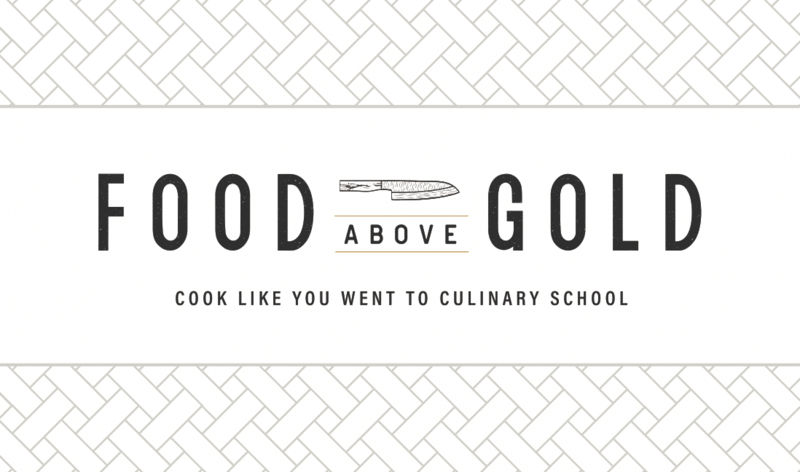 Start Here To See Why Food Above Gold Is Your New Favorite Food Blog! Hi there! Welcome to Food Above Gold, a new and modern way to get a culinary education at home! Do you ever get frustrated when you read a poorly written recipe on a food blog or in a cookbook? Maybe it gives the instructions written in jargon that you don’t understand? Perhaps the recipe is written in a way that seems unapproachable or even unachievable? Cooking should be accessible. That’s one of my biggest pet peeves frustrations. I AIM TO BE DIFFERENT. I want to change how YOU approach cooking by teaching you the techniques taught in culinary schools around the world. With these cooking foundations, you’ll be able to predict whether or not a recipe is going to work. You’ll be able to reorder the steps to get better flavor. You’ll be able to see through the jargon, understand what the recipe is trying to achieve, and adjust accordingly. No longer will you spend an hour and a half preparing a 30 minute recipe. You won’t get to the end of the recipe and wonder what on Earth you are going to do with your leftover ingredients. You’ll be confident in the kitchen in a way you haven’t been before now. Firstly, by making each recipe post approachable and useful. I’m not the type to give a 300 word story about how a family party resulted in an out-of-this world last minute recipe. However, I will give you nuanced details about WHY I’m choosing to construct a recipe a specific way. I’ll talk about the best way to store and reheat leftovers so the quality is maintained. I’ll give you useful tips and tricks for best success, as well as tie in some other fantastic skills and techniques to help you elevate the recipe even more. Beyond that, you can learn knife skills, like how to cut a perfect brunoise or chiffonade. You can get the ACTUAL hacks used in professional kitchens to save time and energy. I’ll even give you honest recommendations and reviews for products that I love and are actually worth the space they occupy in my kitchen. With the recipes, of course! My page is brimming with delectable delicacies and savory surprises. Each recipe links back to the fundamental skills required for instant success, and my approachable style will never leave you scratching your head. However, if you’re looking for more than just some tasty recipes, I recommend starting in my techniques section. It answers many of the the cooking questions you have. Click on any of the options below to go check out those sections. If you don’t see something that has been plaguing you, hop on over to my contact page and send me an email. I always love to hear from you and will endeavor to get you an answer as soon as I can! Happy cooking, my friend. May your knife always be sharp and your recipes never dull!